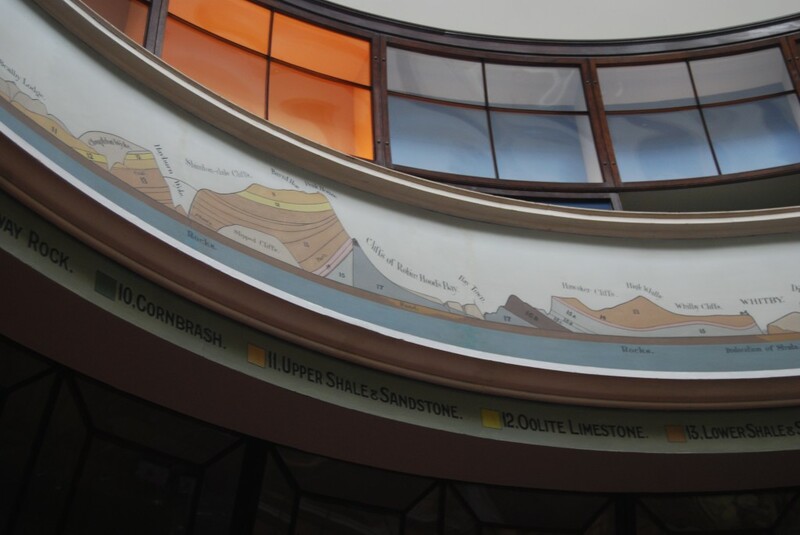 On a plot of land below where the Crescent was later built the Rotunda Museum, designed for the Scarborough Philosophical Society by Richard Hey Sharp in collaboration with the geologist William Smith “the father of English geology”, was opened in 1829. It was one of the first purpose-built museums in the country, and its shape specifically assisted the display of geological specimens in chronological order. Sharp’s design provided for lateral wings which were built in the 1860s and extended in 1881. Other planned but unbuilt embellishments to the Sharps’ scheme included a columned and pedimented Bazaar and Saloon alongside the Rotunda and a monumental column in the middle of the Crescent Gardens. In 2008 the Rotunda was ambitiously restored and modernised, and now provides a better-than-ever introduction to the geology and local history of the area. In a relatively small space there is a surprising amount to read and examine. It’s an excellent place to pass the time when the weather’s unpleasant. Across the road, you can leave your car at the scene of a particularly crass piece of 1960s municipal vandalism. Eugenius Birch, the pier-designer, constructed the People’s Palace and Aquarium, which extended underneath Ramshill Road, providing three acres of underground entertainment facilities at a cost of £100,000 in 1875-7. Conceived by the director of the Brighton Aquarium, it was taken over by Scarborough Corporation in 1921: it became a wonderful and elaborate amusement arcade, latterly known as Gala Land, and was eventually demolished in 1968. The site became an underground car-park – and a missed opportunity. Scarborough is not well-blessed with under-cover entertainment facilities. Hindsight is easy, but so is myopia. The Sixties preoccupation with accommodating the private car led to the destruction of an indoor entertainment facility in a prime location, in favour of a car park that could have been cheaply located elsewhere. Details of opening arrangements and activities at the Rotunda Museum are at http://www.rotundamuseum.co.uk. This entry was posted in Yorkshire's Seaside Heritage on December 31, 2013 by Mike Higginbottom. Before the railway came in 1845, Scarborough was entirely an elegant, exclusive resort for visitors who could afford to stay for a substantial season and would require appropriate housing. The Crescent was begun in 1833, designed by Richard Hey Sharp and Samuel Sharp of York. 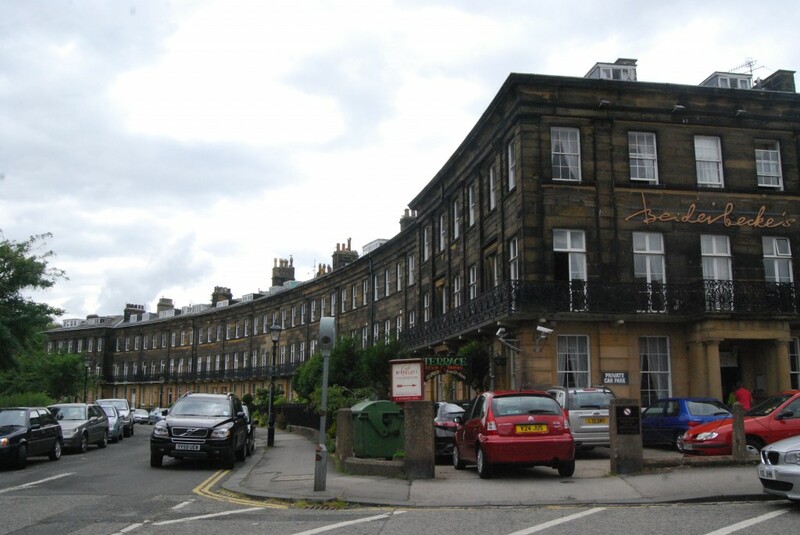 This ambitious residential scheme proceeded slowly: the smaller Belvoir Terrace was complete by 1837, but only four more houses had been built by 1850, and construction was not fully completed until 1857, by which time the arrival of the railway had permanently changed Scarborough’s character. The Sharps originally envisaged seven villas overlooking the South Cliff: eventually four were built – Wood End (1835, extended c1902, latterly the Museum of Natural History), Crescent House 1835-6, enlarged 1845-6, later Broxholme, now the Art Gallery), Warwick Villa (1837, later Londesborough Lodge after purchase by the first Lord Londesborough) and East Villa (1830s, later Belvoir House and eventually the White House). These residences brought style to the locality: Sir Osbert Sitwell, whose family occupied Wood End from 1862 until 1925, tells of his grandfather, the 1st Earl of Londesborough, taking his visitors from Londesborough Lodge across the bridge to the Spa on foot along nearly a mile of red carpet. When I’m in Scarborough I like to call at the Art Gallery to revisit the atmospheric moonlight paintings that Atkinson Grimshaw (1836-1893) painted while living at the Castle-by-the-Sea in the late 1870s. The Gallery has a strong tradition of interesting visiting exhibitions, and excellent coffee, which you serve yourself and then settle up with the welcoming and informative reception staff. Even if there weren’t many other reasons to visit Scarborough, the Art Gallery would be worth a detour. For details of the opening-times at Scarborough Art Gallery, see http://www.scarboroughartgallery.co.uk. Anyone who was sentient at the time recalls where they were on September 11th 2001. I was taking a class of sixteen-year-olds through the text of Shakespeare’s Macbeth, and we were discussing – in relation to the three Witches – whether there could be an independent force of evil, or whether it existed only in the hearts and minds of human beings. We only realised later that during that time the planes were slamming into the World Trade Center. The so-called “twin towers”, which were not actually identical, were developed in the late 1960s to revitalise the southern tip of Manhattan. Their genesis was controversial, because they belonged to the Port Authority of New York and New Jersey which was independent of city and state planning jurisdiction. Designed by Minoru Yamasaki & Associates in conjunction with Emery Roth & Sons, they were not universally liked. These elegant modernist towers, clad in aluminium alloy, were dismissed by one writer, Lewis Mumford, as “filing cabinets”. Inevitably, they grew to be an immediately recognised part of the cityscape. Ed Vulliamy, in an Observer article [August 21st 2011] describes how they told the passing of each day: “…deep gold at the eastern edge in the early morning, becoming paler towards midday and deepening again to a tangerine glow at dusk”. They also contributed to New York legend. Philippe Petit, a French tightrope walker, walked from one tower to the other in 1974 and was, for his pains, arrested for trespassing. 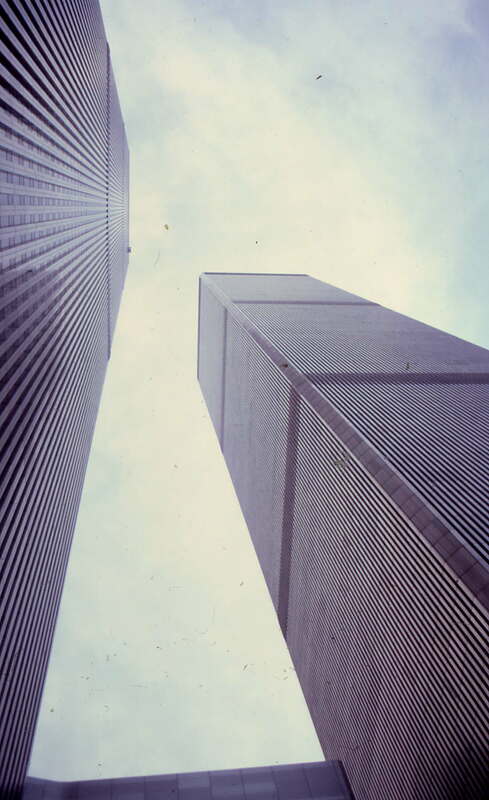 Three years later George Willig climbed the outside of the south tower using suction-pads. And they were celebrated by tourists. Express lifts carried the public in slightly under a minute past ten million square feet of office space to the indoor observation deck on the 107th floor, from which escalators gave access to a surprisingly unvertiginous roof-deck. Bizarre effects were experienced at this height, including upwardly mobile rain. The towers attracted the attention of terrorists because of their particular design and their proximity. A bomb which exploded in the basement on February 23rd 1993, destroying five floors, killing six and wounding at least a thousand, was apparently intended to tip one tower over to demolish the other. The final atrocity, which killed over 2,752 people in the buildings, on the planes and in the frantic rescue operation, was no random attempt to create a terrorist “spectacular”. The people who perpetrated this massacre knew perfectly well that flying a plane into, say, the Hancock or the Sears Towers in Chicago would do great damage but might not engineer a collapse. The World Trade Center towers were constructed with external load-bearing walls to provide open-plan office space. Though they had been designed to withstand an accidental collision, the airliners’ wingspan of 156ft ripped through buildings only 209ft wide. The height of the impacts was far beyond the range of ground or airborne firefighters, and the amount of kerosene on board aircraft at the start of transcontinental flights created enough heat to weaken the steel structure, causing the floors to implode with terrifying speed. Among the 9/11 terrorists were individuals with civil engineering expertise, trained to build things. This wasn’t only a violent and a perverse act. It was calculated evil. This entry was posted in Exploring New York City on December 31, 2013 by Mike Higginbottom. Almost opposite Liverpool’s Catholic Cathedral stands – for a short while longer – an undistinguished building of huge cultural importance. 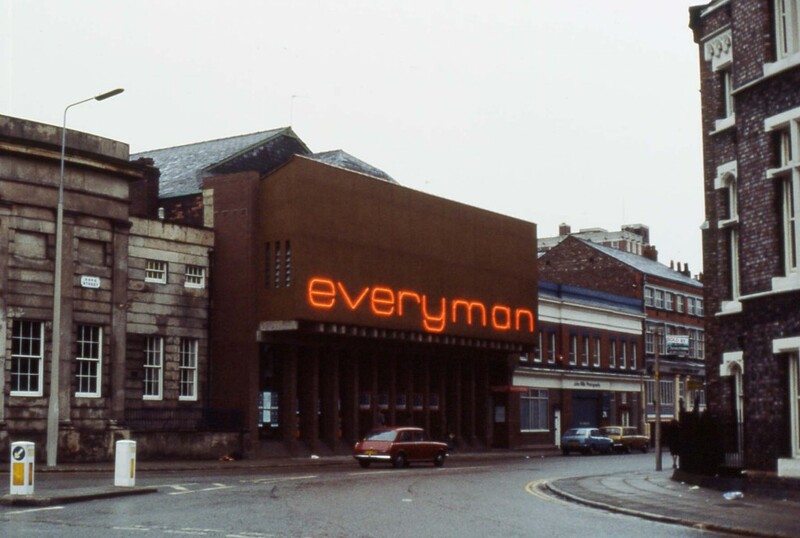 The former Hope Hall, a nonconformist chapel of 1837, after many transformations, became the Everyman Theatre in 1964. This was the cockpit of artists, writers and playwrights in the great wave of Liverpool’s prominence that followed the success of the Beatles. The poets Adrian Henri, Roger McGough and Brian Patten, the playwrights Alan Bleasdale and Willy Russell, and a cluster of actors including Bernard Hill, Anthony Sher, Julie Walters and the late Pete Postlethwaite were associated with the building before and after a further rebuilding in 1975-7. 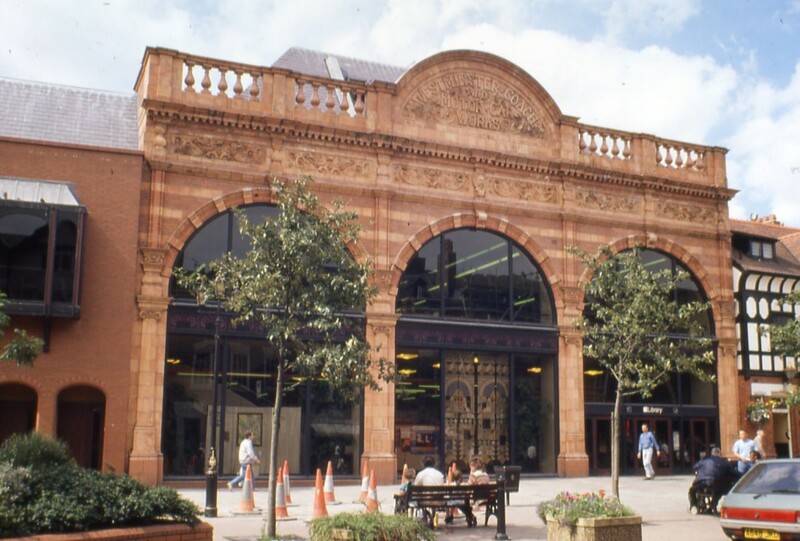 The premieres of Willy Russell’s John, Paul, George, Ringo…and Bert (1974) and Shirley Valentine (1986) took place at the Everyman Theatre. The building was also celebrated for its Everyman Bistro, founded in 1970 by Paddy Byrne and Dave Scott in the basement. Here was as good a buffet as you could find in Liverpool, and a convivial atmosphere without rival. Now the Everyman is to be replaced by an entirely new building, opening in 2013, and you can watch the process, day by day, at http://www.everymanplayhouse.com/content/Home/AboutUs/NewEveryman/LiveCam.aspx. Sooner or later, you’ll see the queue for the reopening. Sarah Horton and Ronnie Hughes’ film tribute to the Everyman Bistro is at http://www.youtube.com/watch?v=EibgxJnWMKU&feature=player_embedded. The opening season at the new Everyman begins on Saturday March 8th 2014 with Twelfth Night: http://www.everymanplayhouse.com/show/Twelfth_Night/1031.aspx. This entry was posted in Fun Palaces, Life-enhancing experiences, Liverpool's Heritage on December 31, 2013 by Mike Higginbottom. 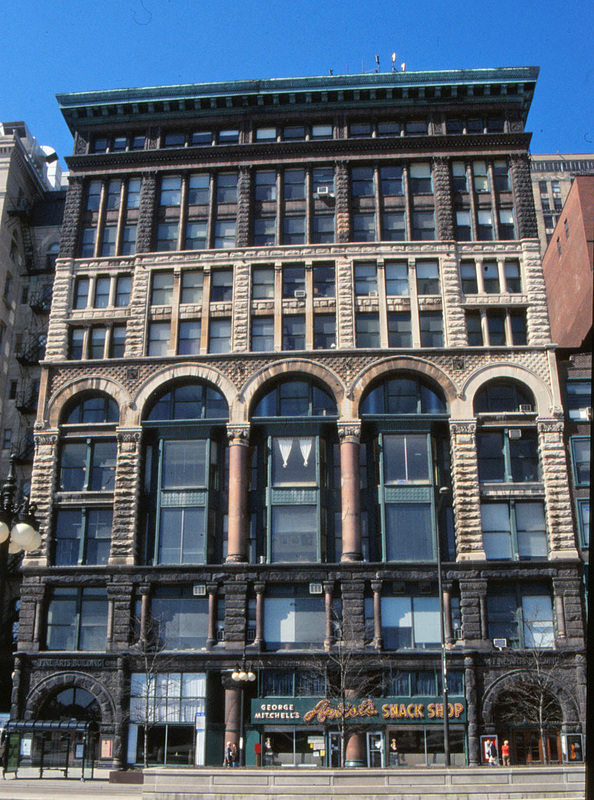 Just as Chester’s central library incorporates a fine example of early automobile architecture, so Chicago’s Fine Art Building is based on the Studebaker Carriage Works of 1884-5. The five Studebaker brothers started out in the 1850s building wagons for the military, for the California gold rush and for those pioneers’ covered wagon-trains that figured in a landmark 1960s television series. Gradually they extended their repertoire to more genteel passenger carriages. Their works was at South Bend, Indiana, and in 1884 they opened their showroom, designed by Solon Spencer Beman, at 410 South Michigan Avenue in central Chicago. It was designed to receive carriages in kit-form, which were lifted to the upper storeys in small pieces and then assembled floor by floor until they reached the ground-floor showroom where they could be sold and immediately trundled out on to the street. Chicago’s birth as a cultural centre grew from the World’s Columbian Exposition of 1893, celebrating the quatercentenary of Christopher Columbus’ arrival in the New World. In the afterglow of the World’s Fair, as it’s more commonly known, the Studebaker building, which stands in the same block as the Auditorium Building of 1889-90, was adapted in 1898 as a centre for artists of all kinds, and it continues today as a venue for painters, musicians, dancers and designers – http://www.fineartsbuilding.tv/directory.html. The adaption included two auditoria, the Studebaker Theater and the smaller Playhouse Theater, both of which were earmarked for restoration some years ago: http://leisureblogs.chicagotribune.com/the_theater_loop/2008/08/historic-studeb.html. During the 1898 renovation a series of murals by Martha Baker, Charles Francis Browne, Frederic Clay-Bartlett, Oliver Dennett Grover, Frank X Leyendecker and Bertha Menzler-Peyton were installed on the tenth floor. Take the ancient lift, and enjoy the sounds of the resident musicians going about their daily work. The Fine Art Building provides regular events for the public: see http://www.fineartsbuilding.tv/events.html. For details of Mike Higginbottom’s lecture ‘Windy City: the architecture of Chicago’ please click here. This entry was posted in Exploring Chicago, Transports of Delight, Victorian Architecture on December 31, 2013 by Mike Higginbottom. It’s remarkable how much built history is literally invisible. Among John Minnis’ slides when he talked to the Victorian Society South Yorkshire Group about ‘Early Automobile Architecture’ was one image of my native Sheffield that made me double-take. John knows Sheffield because he co-authored the Pevsner Architectural Guide on the city. He pointed out Cavendish Buildings on West Street as an example of an early purpose-built motor-sales and repair shop. I thought it was a wine-bar, until I remembered that it used to belong to the Kenning Motor Group. In fact, I once hired a car there. Cavendish Buildings has a very fine, imposing terra-cotta façade, obviously designed in one piece but actually, by the date-stones on the semi-circular pediments, built in three stages, 1907, 1910 and 1919. 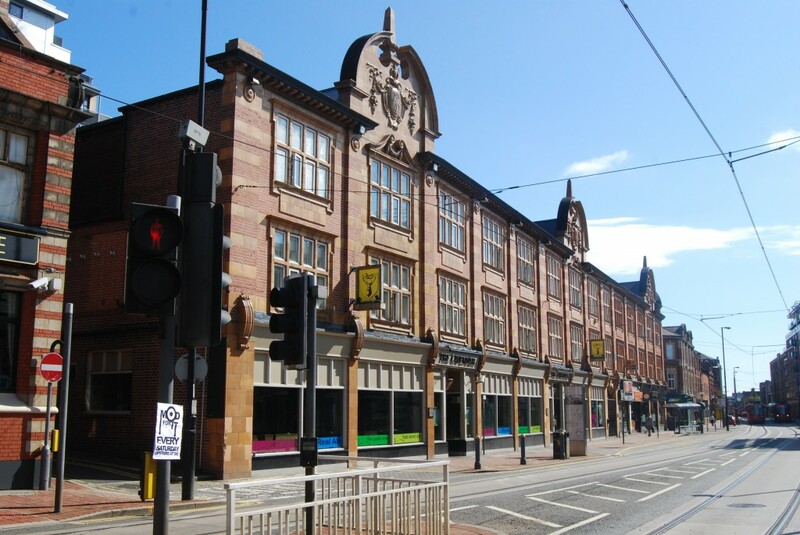 It was built for the Sheffield Motor Company Ltd with, according to Ruth Harman and John Minnis’ guide, showrooms at street level and, on the upper stories, one of those repositories of misspent youth, a billiard hall. Contributors to the history forum http://www.sheffieldhistory.co.uk/forums/index.php?showtopic=5408 relate that during the Second World War part of the upper level was occupied by the apparently lively Central Labour Working Men’s Club, and later the space was used by the Cavendish Dance Studio. Until at least the 1970s there was a car hoist within the building, presumably serving repair shops on the first floor. To passers-by, of course, its original use had long been forgotten. Now you can eat and drink at the Cavendish: http://www.screampubs.co.uk/thecavendishsheffield – even if you don’t qualify for student ID. And you can see it in 3D at http://sketchup.google.com/3dwarehouse/details?mid=6a8d33f318df7d744522e2cc67bda51&ct=mdsa. Future meetings of the Victorian Society South Yorkshire group are advertised at http://www.victoriansociety.org.uk/south-yorkshire/forthcoming-events. Guests are welcome. The biscuits are excellent. This entry was posted in Sheffield's Heritage, Transports of Delight, Victorian Architecture on December 31, 2013 by Mike Higginbottom. Just before Easter 2011 I listened to John Minnis give a talk on ‘Early Automobile Architecture’ to the Victorian Society South Yorkshire Group. John is already known to the Group because some years ago he was the joint author, with Group member Ruth Harman, of the Pevsner City Guide Sheffield. Now he’s working on an English Heritage project surveying the architecture of the motor trade from its inception in 1896 – garages to repair cars, garages to store them, salesrooms to sell them and accommodation for the chauffeurs. Like the contemporary development of the cinema, architects responded to a new technology with astonishing speed, which is why it’s a suitable subject for a Victorian Society event, even though the Society’s remit ends in 1914. Motor cars were, of course, originally thought of and designed as horseless carriages, and John’s illustrations showed how ways of marketing and stabling the new vehicles grew directly from the existing practices of horse-drawn transport. There were significant distinctions, however: cars do not produce tons of manure, and their fuel is even more inflammable than hay. The Group Chairman, Valerie Bayliss, suggested in her vote of thanks that all the components of the motor trade – including dodgy second-hand dealers – were in existence by the 1820s, apart from the internal combustion engine. One of the best known and most distinctive examples of early motor architecture is the Westminster Coach & Motor Car Works on Northgate in Chester, very near to the Town Hall. This elaborate terracotta façade is dated 1914, but appears to be based on an earlier building for the carriage-builders J A Lawton & Co that was burnt down on July 1st 1910. Their building was two storeys high, but otherwise apparently similar to the existing design. Cars were sold on the site until the 1970s, and a new library was built behind the façade to an award-winning design by the Cheshire County Council Department of Architecture in 1981-4. The library itself will move on soon, apparently, and the Car Works site will become a market. The 48-page, A4 handbook for the 2009 Historic Chester tour, with text, photographs, and a reading list, is available for purchase, price £15.00 including postage and packing. To view sample pages click here. Please send a cheque, payable to Mike Higginbottom, to 63 Vivian Road, Sheffield, S5 6WJ. This entry was posted in Historic Chester, Victorian Architecture on December 31, 2013 by Mike Higginbottom. 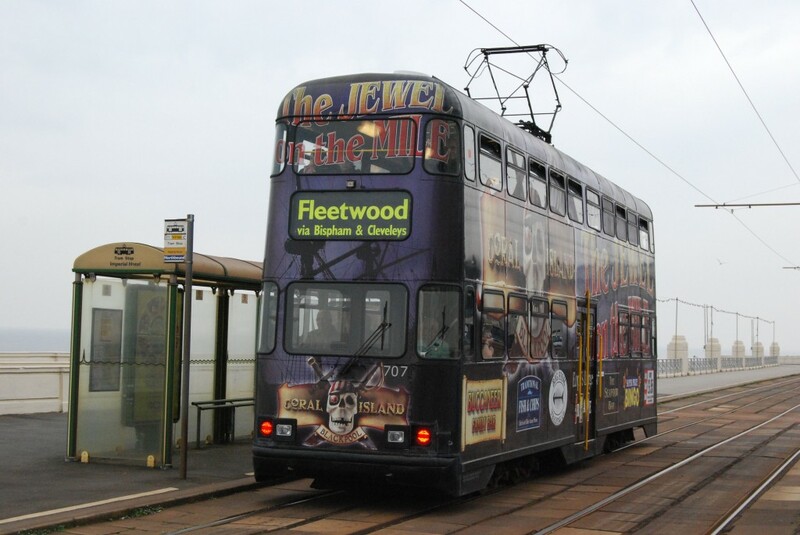 I had occasion to drive the length of the Flyde coast from Fleetwood to Lytham in the summer of 2011, and discovered – as any tram enthusiast could have told me – that major changes were afoot on the Blackpool tramway. That means that the summer of 2011, until the end of the Illuminations on November 6th, was the very last time a public-service tramway will operate in Britain with technology that is essentially Victorian. Blackpool’s proud history of electric trams back to 1885 encompasses a traditional first-generation tram system which was comprehensively upgraded from 1932 when the transport manager, Walter Luff, introduced a fleet of streamlined luxury vehicles, in four different models, alongside a parallel fleet of streamlined centre-entrance buses. 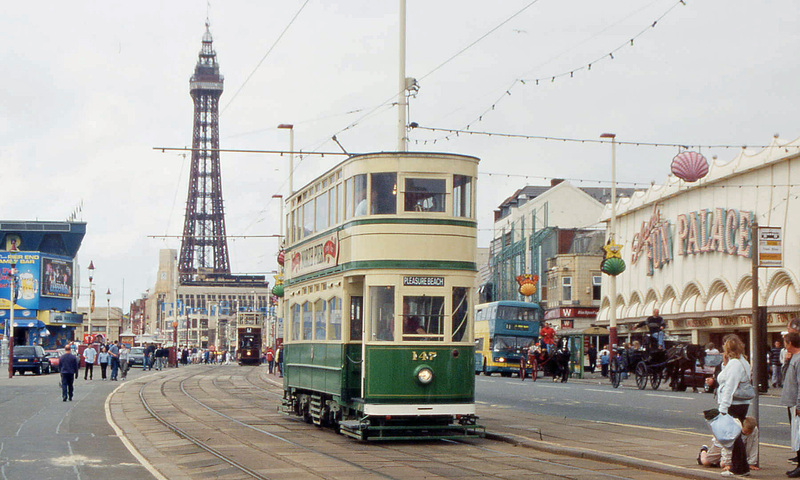 When all other mainland British electric tramways were replaced by diesel buses after the Second World War, Blackpool still needed the promenade trams because there was no other practicable way of shifting the crowds that visit Blackpool for the Illuminations. Over decades the system has struggled on, rebuilding 1930s trams in various guises, buying in one-off designs from the local bus manufacturer and patching the track and overhead time and time again. Eventually, in 2008, a package was agreed between local, national and European authorities to convert the tramway to the standards now familiar in Manchester, Sheffield, Croydon, Nottingham and elsewhere. In Blackpool the heritage fleet, as it is now called, continues – discreetly modified to comply with the new traffic signalling, operating out of the original depot at Rigby Road. But when the older cars are trundled out it’s for show. This was the very last time, after a century and a quarter, that ordinary passengers clambered aboard traditional British tramcars to go to work, to shop or to get home. In the 1880s the borough first introduced electric trams and electric street lighting: then and now Blackpool’s civic motto is “Progess”. This entry was posted in Lancashire's Seaside Heritage, Transports of Delight on December 31, 2013 by Mike Higginbottom. When I last stayed in Blackpool for a birthday celebration we took a walk along the North Pier at dusk. On the way back to the promenade I ended up in conversation with two siblings, Richard, who was twelve but looked sixteen and had lost a tooth in a rugby match, and Natalie, eighteen, who was about to read medieval history at a university of her choice. Natalie, who’s grown up down south and whose immediate family usually holidays abroad, was fascinated by the unfamiliarity of being in the great working-class resort of the north-west. I pointed out that the Tower is a vertical pier – sturdy engineering topped with a fairy-tale structure five hundred feet above the sea. When it opened in 1894 anybody with a few pence in their pocket could stand nearly five hundred feet in the air, an experience otherwise only accessible by balloon. When we returned to the promenade a tram glided past, one of those huge double-deckers gleaming with light. I mentioned that Blackpool had one of the first electric street tramways in the world, dating back to 1885. At least as important, in historical terms, is the fact that the Corporation tramway department pioneered the development of Blackpool’s greatest stroke of municipal acumen. To mark a royal visit in 1912, the tramway electricians were asked to festoon the promenade with coloured lamps, which drew so many extra visitors that from 1913 onwards, interrupted only by two wars and the General Strike, the Illuminations, as they were called, extended the Blackpool season by anything up to two months, adding to the prosperity of landladies, hoteliers and shopkeepers, enhancing the profits of the railway companies and subsidising the municipal rates from the increased profits of the trams themselves. It made practical sense, during the busy summer season, for tram engineers to work on the Illuminations, while all their vehicles were needed on the road, and the autumn visitors kept the trams busy to the end of October. Eventually, a separate Corporation department was established to run the Illuminations, and until the establishment of the National Grid, Blackpool had to buy additional power from Preston Corporation, because their own generating works couldn’t cope with the extra load. As I pointed out to Natalie, when people go to see the Blackpool Illuminations, they’re doing something essentially Victorian – admiring electricity. Details of this year’s Illuminations are at http://www.blackpool-illuminations.net. This entry was posted in Fun Palaces, Lancashire's Seaside Heritage, Transports of Delight, Victorian Architecture on December 31, 2013 by Mike Higginbottom. I wrote this piece while I was staying in Christchurch, New Zealand, in the week before the February 2011 earthquake. 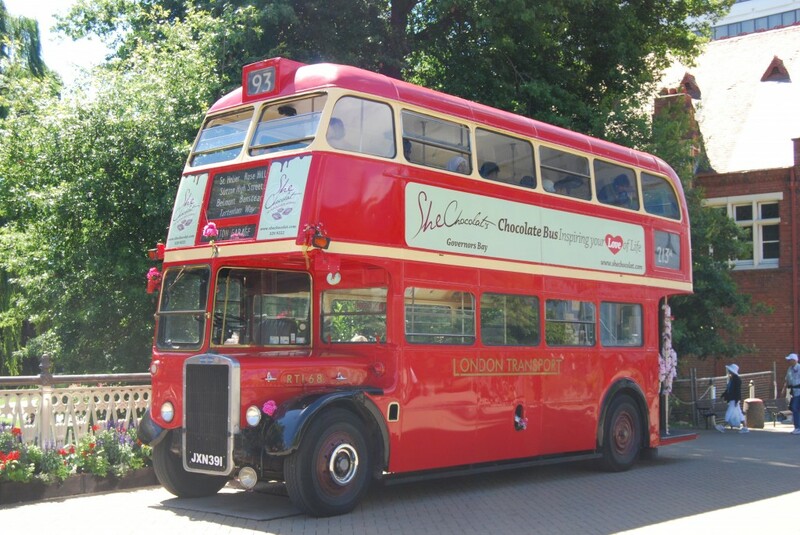 On my first morning in Christchurch I spotted the familiar and unmistakable shape of a London Transport red double-decker, and booked a tour that afternoon. My friend Doug, who likes buses, would have been miffed not to ride on the roof-box RTL that I’d seen; I rode in a common-or-garden Routemaster, but I’m easy to please and a red bus is a red bus. I’m only concerned that it has a top deck and windows that open in hot weather. The conductor, for so he called himself though he didn’t ring the bell or shout “Hold tight”, was Paul, who quickly entered my pantheon of tour-guides I wish to emulate. He was adept at the fortissimo bonhomie required by cruise-groups and loud American ladies who chirp and squawk fit to drown the PA system. When they stopped talking and listened it was quickly apparent that Paul knew his way round Christchurch, and that his presentation was as sharp as a pin. He could fill in time when stuck in traffic, yet never missed a cue to point out sites, and if he said look left he meant left not right. The bus company is aptly named Hassle-free Tours [www.hasslefree.co.nz]. The logo and web-address on the side panels of the Routemaster use the elegant, authentic London Transport Johnston font. It’s a quality outfit: the entire fleet runs on biodiesel fuel from restaurant cooking-oil. As an introduction to Christchurch the itinerary was ideal – a quick spin round the city centre for orientation, a walk in the park to Mona Vale Mansion (designed by Joseph Clarkson Maddison 1899-1900), a walk in another park to Riccarton House (1856 onwards) and the transplanted Deans Cottage, the successive homes of the Deans family who first settled the site of Christchurch, and a look at the Riccarton Bush, a preserved area of the vegetation that filled the Canterbury Plain before the Deans tamed it, now used as a kiwi nursery. Then the bus headed out of town for an ice-cream at the seaside resort of Sumner – Christchurch’s answer to Bondi Beach (though no-one with sense would surf around Cave Rock). And then Steve the driver came into his own as the bus crawled up the precipitous road over the Port Hills to the port of Lyttelton, where cruise liners sit alongside the wharves from which west-coast coal is loaded for shipping to China, Japan and South Korea. There’s no finer introduction to Christchurch and its surroundings than the precipitous ride back over Mount Pleasant Road, savouring the views from the top deck of a vehicle built to chug down Oxford Street, driven with care and precision and much horn-sounding on the hairpin bends by Steve. Mona Vale Mansion is closed because of earthquake damage for the foreseeable future. This entry was posted in Exploring New Zealand, Life-enhancing experiences, Transports of Delight on December 31, 2013 by Mike Higginbottom.